As a series of aftershocks continued to rattle Kumamoto Prefecture on Wednesday, swarms of people turned up at an outlet run by its government in Tokyo’s Ginza district, hoping to support the disaster-hit region by purchasing local specialties. Such outlets operated by local governments are called “antenna shops,” and a number of them promote and sell their regional food and drink in Tokyo. 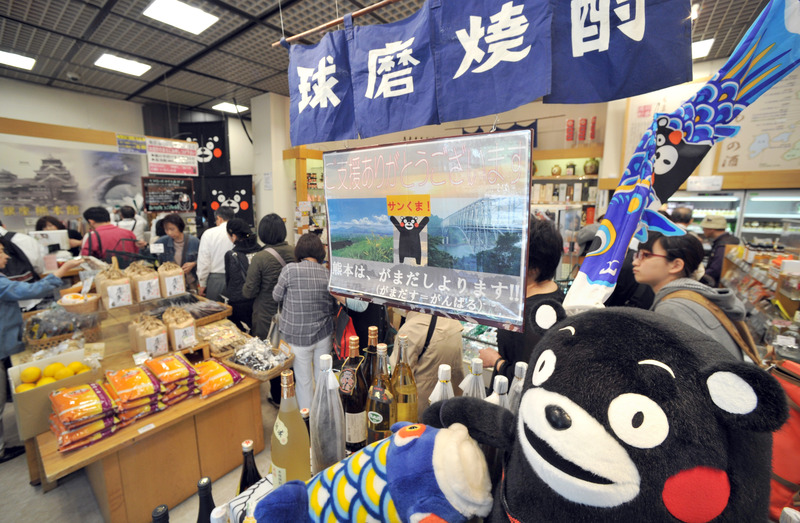 Dozens of people waited in a line Wednesday morning in front of the Kumamoto Prefectural Government-run Ginza Kumamoto-kan, which sells some 1,000 local products including goods featuring the popular bear mascot called Kumamon. 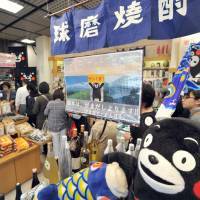 The number of visitors to the shop has reached nearly 9,000 in the three days since a magnitude-7.3 earthquake struck the prefecture early Saturday, and it posted a two-day sales record of ¥5.96 million over the weekend, according to the prefectural government’s Tokyo office. 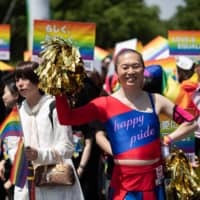 By Tuesday night, the shop had also received about ¥10.4 million in donations, Atsuhiro Hori, a spokesman for the shop, said. “I’m touched by the support from so many people and the kind words they’ve given us,” Hori said. Nobutaka Otsuka, a 38-year-old resident of Tachikawa, who visited the shop to purchase local specialties, said it was the only thing he could think of to support the devastated region for now. “I can’t go to Kumamoto as I have a job and have a little child to look after. But I wanted to do something to support people in Kumamoto even if it’s a little thing like purchasing local products,” Otsuka said, while waiting in line to enter the shop with his 2-year-old son. “We never know when we will be the next one to suffer from a similar disaster. 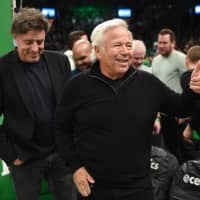 It’s important to do what you can to support people who are suffering,” he said. Mieko Kora, 63, who traveled from Yokohama with a friend, said she came to donate some money. “It’s heart-wrenching to see the state of Kumamoto. 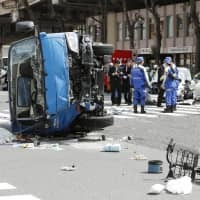 I’ve had the TV on all day to get the latest information,” Kora said, adding that she has not been able to reach her friend in Kumamoto since last week’s deadly temblors. Oita Prefecture native Kazumi Tanaka, 64, who now lives in the city of Funabashi, Chiba Prefecture, also said she wanted to do something to help the disaster victims.